One of our greatest discoveries began while conducting research on the Internet. We came across four words that perfectly described what we were seeking: Cruise Halong Bay. 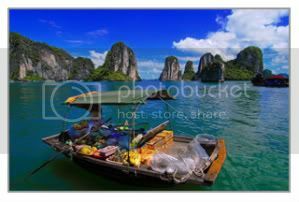 Active Travel Vietnam offers various upscale cruises & tours to Halong Bay. What we looked for was a combination of luxury, adventure, and unique experiences. 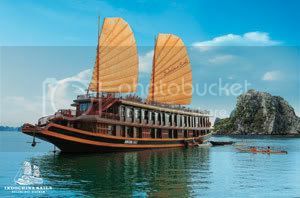 From Active Travel company’s website, I was able to book a luxury cruise trip to Halong Bay, the UNESCO World Heritage site that lies 175km east of Hanoi. With a simple mouse click, it was done. I couldn’t wait to get out of the city for the weekend even though I had visited Halong Bay before. Stepping out of the private car in Ha Long City, I was greeted at the private jetty Indochina Sails Junk staff. We then rode a small speed boat to board the junk. I remember that during my last trip to Halong Bay I had to wait at the dock behind a herd of tourists and a traffic jam of boats. Our junk was outfitted with 15 rooms made of aromatic wooden. The cruise itinerary was different from other tours. But I was most impressed by the personal service. We were welcomed with a cocktail, informed of the tour’s program and enjoyed great food and service that combined romantic tradition and modern luxury. My deluxe room on the upper floor provided everything you’d expect in a five-star hotel. I enjoyed the marble bathroom, and took a blissful shower before going up on deck for a drink at sunset. I lay down and let my mind escape, enjoying the sky in the beautiful and clear afternoon, the sound of the waves lapping on the boat’s hull as we cruised leisurely through a maze of small, rocky islands jutting from the calm and emerald waters. The junk tour offered kayaking, boating, fishing activities. My travel colleagues and I enjoyed ourselves over a glass of wine while other guests enjoyed swimming on Soysim Beach. For dinner, we enjoyed a BBQ meal while we exchanged stories with other fellow travelers. Sitting next to me was a British couple who were also the guests of Active Travel Vietnam Company. After a few glasses of wine, they shared their 10-day experience in Vietnam and how they enjoyed the last night of their honeymoon holiday in Vietnam before returning home. “The service we received from Active Travel Vietnam was world class,” said Bernadette Tompar, who can’t wait to share her tales with family and friends in London.